From Community College of Philadelphia to Peirce College – Meet Efrain Aponte, Jr.
Efrain Aponte, Jr. began college as an 18-year-old traditional student. He aspired to pursue a career in Information Technology, so he took his young and eager mind to the Community College of Philadelphia (CCP) to begin working toward a degree. 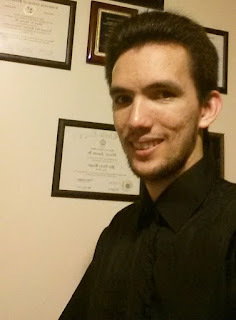 At age 24, after many years of part-time classes, Efrain graduated with his associate’s degree in Computer Information Systems. But Efrain struggled with where to go next after graduation. “I found myself contemplating on whether I should either seek employment in my desired program of study, or perhaps enhance/elevate my education,” Efrain recalls. His family and friends advised him to look around and see what colleges were available to him that would be willing to accept his credits from CCP. That wasn’t all Efrain discovered in his research of Peirce College. “In addition [to the credits transferring], I would also qualify for a scholarship—due to my associate degree—that would eventually aid me per my education.” Knowing this, Efrain felt motivated to continue his education at the age of 25 at Peirce College in the fall of 2014. Efrain quickly transitioned into Peirce, finding support and flexibility everywhere he looked. “The administration at Peirce College [e.g. faculty, staff, professors, advisors/specialists, students] have guided, assisted, and even molded me towards success in my 2+ year tenure. After starting his educational journey as a traditional-aged student, Efrain could see how different going to college was as a working adult learner. “By the age of 25 and with a job [two in 2016, thanks to the work-study program at Peirce], I did notice that things were clearly different; it was a little more challenging to handle both work and school,” he says. But Efrain didn’t let the challenge of work/school balance get in his way. Just a few weeks ago, he graduated from Peirce College with a Bachelor’s of Science in Information Technology with a concentration in Networking, Administration and Information Security, while also receiving the Margaret Obozian Excellence in Writing Award at Commencement. Congratulations to Efrain Aponte, Jr. on graduation and his award! We look forward to watching him continue to soar into the Information Technology field. If you wish to begin your educational journey or continue on, like Efrain did, contact an Enrollment Specialist today at 215.670.9000 or admissions@peirce.edu. Or if you’re interested in learning more about the partnership between CCP and Peirce College, contact Tom Tschop at 215.670.9203 or ttschop@peirce.edu.